Commission President José Manuel Barroso said yesterday (12 September) that he came up with the idea that European political parties present their candidate for the top EU job at the European Parliament elections in 2014, and regretted that little progress had been made in this direction. Barroso said there was a risk that the campaign would take place without a clear public debate between representatives of the different political forces competing with the role of Commission president. He insisted on the role he was playing in changing the system. “It was me who last year proposed this idea in my State of the Union speech, which I think is a contribution to a certain Europeanisation of the elections. This would allow to European political parties, which are still structures in development […] to stabilise their programs and to set a platform around personalities,” Barroso said. Barroso was speaking to reporters as part of a Commission communication effort to highlight the messages of this year’s state of the union address he delivered in the European Parliament on Wednesday (11 September). The major European political families are expected to elect soon their Commission president candidate in an effort to put a “face” on the EU elections next May. Barroso said that he had no illusion that this change would be sufficient to transform the European elections into “a real European event”, but added it would be a “step in the right direction." The current Commission president stressed his desire for common candidates among the EU countries, preventing the European elections from becoming an amalgam of 28 national campaigns, as had happened in previous elections. Common candidates would give a more European feel to the democratic exercise, he added. “To my knowledge, no party has designated candidates," Barroso said, adding that he would advise them to do so. Barroso said that the timing of selecting candidates was a matter of political strategy and also depended on the availability of candidates who currently occupy other positions which are incompatible with political posturing. Barroso also said it would be “interesting” if the candidates of the European political parties held televised debates similar to those before national elections. But he seemed to exclude anti-Europeans from the scheme. “Why not organise a debate, at least among the main political forces in Europe? You saw the German election campaign, and the moment which most affected public opinion was the debate between the two candidates”, he said, referring to the televised debate between CDU’s Angela Merkel and her Social Democrat rival Peer Steinbrück. Barroso remained non-committal over whether he would stand again for the Commission top job. Barroso's laying claim to the idea of putting a "face" on the European elections will likely rile the Party of European Socialists, who floated the suggestion in 2010. The Socialists decided in a November 2011 PES congress in Brussels that they would name a candidate for Commission president through internal primaries before January 2014 in each of the national member parties and organisations. But the PES has since backtracked on holding primaries. For the European People’s Party (EPP), of which Barroso is a vice president, the situation is even more unclear. Another EPP vice president, Council President Herman Van Rompuy, who is not himself a candidate, openly criticised the idea of holding direct elections for the EU's top jobs. The Liberal ALDE political party said it would dicuss candidates at the party’s pre-summit meeting at the margins of the 19-20 December European Council, and that if more than two emerged, they would hold a vote in spring. The Green party announced that they would elect through primaries not one but two candidates for the EU elections, further confusing the picture. The 2014 elections – the first to be held under the Lisbon Treaty – will allow the Parliament to elect the president of the Commission on the basis of a proposal by the European Council taking into account the results of the European elections (see Article 17.7 of the Treaty on European Union). The Lisbon Treaty however says nothing about the direct election of the European Commission president. Barroso appeared to backtrack on his what came across as an undiplomatic warning to British Conservatives that they risked losing out to the eurosceptic UKIP party in the next British elections. During the debate after the state of the union speech, Barroso fired the quip at Conservative Tory MEP Martin Callanan, the leader of the European Conservatives and Reformists (ECR) group in the European Parliament. Callanan accused the Commission of representing the "vested interests of the European District in Brussels not the people of Europe". Barroso replied with unusual bluntness, saying that the British Conservatives were merely copying UKIP in their eurosceptic stance and may therefore lose out at the upcoming British elections as a result. 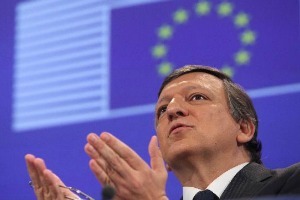 Yesterday, Barroso sought to soften the dig at Prime Minister David Cameron's Conservatives. “What I said there was not meant specifically at the UK situation. I’ve been saying that in other situations, for example in France, and also in Germany, in Greece, I’ve been saying this. I’ve been saying that if the pro-Europeans and those who have a constructive position, and those who have a government responsibility, if they give up and try to follow the pressure of the clear Europhobes, of anti-European forces, then people may prefer the original to the copy,” Barroso said. Asked by EURACTIV if Barroso conveyed the same message to his EPP group, whose members have frequently echoed those anti-European messages, Barroso said he was delivering his warning “to everybody”. Afraid of the ‘F’ word? Asked by EURACTIV why he sidestepped the key word in last year's state of the union, “federalism”, and whether this was linked to the sensitivities in the context of the upcoming German elections, Barroso said that since last year, the Commission had tabled what he called a "little-noticed" document, a Blueprint for a Deep and Genuine Economic and Monetary Union. He described this as a “roadmap for that objective”. “We are working on that and I’ve not changed my position about this. I believe that a political union requires a federative approach. That means not a centralised super-state, but it is a democratic association of the states of the European Union, including of course the representation of the citizens,” Barroso said. The 'State of the Union' speech, largely modelled on the US president's annual address to Congress, is a recent initiative by Commission President José Manuel Barroso. The first such speech was delivered in 2010 in a chaotic atmosphere, after suggestions that MEPs be forced to attend. In last year's state of the Union address, European Commission President José Manuel Barroso passionately pleaded for launching a wide-ranging public debate for a major transformation of the European Union into a "federation of nation states". I proposed putting a ‘face’ on EU elections — … BUT WHAT HAVE YOU DONE? with an from us Europeans elected EU-President ! I propose putting up an acquaintence and distant person from within Malta and a Business-Man of Stature Mr J Micallef. If not then I propose another name and one from the samefraternity and based in the UK Mr P Hurrell. Neither of these persons are in the Political Game as we write but from being outside the Political Arena they have immense credentials. I draw your Attention Mr Barroso to the situation again with Mr Borg as the heir appointed from Malta to replace mr Dalli. Mr Borg from Malta has added insults to the issue of the delays in the smoking lobbyists influencing the Parliament of the EU. By his own admissions and by admitting that the issue to control the tobacco companies has been allowed to influence him just as much as Mr Dalli. Mr Barroso You must show Statemenship here and all of those that have had connections with the Lobbyists from the tobacco companies must be prohibited from voting on the issue. Br Barroso you must remove Mr Borg from his position as well as this is beginning to copy the Dalli situation of earlier. Mr Barroso if you do not get the message that when you dealt with Mr Dalli (also from Malta) then you will have failed your job, and even your position now could be inviolate and then Your Position this year would be censured and you would have to resign through complicit acceptance of the issue. Mr Barroso you have to sort out this mess with the Tobacco Industry before even thinking about Your Re-election. Mr Borg is following the steps of Mr Dalli and that is making a mockery of the EU allowing all the lobbying to go ahead in order to stop this Directive. You must stop this lobbying by the tobacco industry to the MEPs — and as they have paid for lobbying to a third of all the MEPs these should be barred from voting in any respect — and the proposals whould be presented and made and if possible passed. Mr Narroso you must either insist to Mr Borg he moves this or dack him and resign yourself in the process for this is looking like you are involved as well. Fir-Sur Borg qed resoundly jitne? ?a mill-kariga min?abba l-a? ?ettazzjoni tieg?u ta ‘l inheritace Dalli u allegazzjonijiet o?ra Sur Barroso trid tne? ?i Mt Borg u reset-Direttiva proposta Tabakk lura fuq il-binarji immedjatament u jammettu li dawk kollha 30% ta’ MEPs li jkunu a? ?ettaw l- lobbyists tabakk ltaqg?u mag?hom (u huwa dwar ir-rekord Sur Barroso li dawn huma mag?rufa sew) li dawn MEPS g?andhom ji?u m?a? ?da ugwalment ta ‘voti tag?hom fil din il-proposta. Nuqqas li tag?mel dan Sur Barroso jissu? ?erixxi a? ?ettazzjoni kolpevoli Minnek kif ukoll g?al dan, u g?alhekk inti mbag?ad trid tmur kif ukoll is-Sur Borg. The Socialists don’t want to put a face, because since they are going to lose these elections, that face is likely to be chopped off. The Conservatives don’t want to put a face, because Merkel is busy getting reelected and wants to take the necessary time for choosing the colour of her next Brussel poodle. The Greens and the Liberals can’t put a face yet because they are still fighting each other. well has long has the face is not YOU barroso. it’s going to be fine. but it’s not just a face that Europe needs. it’s actually a new narrative, has you said, but not has you imagine or envision. but it also need a new vision, a vision for the new generation that also take into accounts the older generation, but it’s time to build europe for what europe can become, and will be in the future and not only around what is was, and get ride of this conservative side that is slowing down the whole process. EU killed the nation state. at least with its current design. Federalism can be one solution, but it’s impact on national state will be tremendous. maybe a direct result of Federalism will be that countries will transform and become regions to preserve their local traditions and culture and evolve from that into a giant federation with a EU government, elected by all the regions of EU. but it seems EU is to shy to continue the dismantlement of nation states, and at least EU don’t recognize it. preferring to always have the nation state to send back the responsibility of its own failures to nation state is much more easy and practical. But sooner or later EU will have to accommodate itself to the fact that the nation state is dead. that citizens no longer have the tools to be and feel represented at national level and this will bring the question of how to be and feel represented at EU level. how is it going to work ? I don’t know. but we are in a hybrid system where nation state lost their power. on many level. but still we have an EC that is constantly reminding and sending back responsibility to nation states, when EC is at fault. consciously or not. This hybrid system is doomed to fail. the sooner we realize it, the better. the question is are we ready to live in a globalized world, where we can change our model, because we can, because we can experiment, because we can try and change and adapt, instead of languish in a hybrid not-working-looped-system where MORE europe could work, but is not working, because nation states work on a level where there is no more space to actually influence anything. this level need to go back to regions. regions will know better then anyone how to preserve themselves and evolve with new possibilities on a global level. Then the face of the Elections would simply emerge from the masses, because that face will say and will have the vision, citizens need to listen to actually have hope and see an exit to the current mess Europe is . #EP2014 will be the perfect time to launch all these discussion on a global level, without falling into populism and other neoliberal policies that are doomed to fail. It isnot the EU that is the issue, but the administration and lack of open-ness with what it does and on behalf of whom. The idea of the EU is well and truly – in place – it just needs redirecting and positively. The farce over the issues of the Tobacco Directive which Mr Barroso has made a pitch in dismissing Dalli for side-kicks and an investigation has robbed him of any credence. Now we read and have seen the lists of the 200 MEPs who have also had this lobbying (and alleged kick-backs) to prevent that EC Directive going forward the reality of the situation is clear. MEPs are in there for what they can get out of it. Mr Borg has a lot to answer and is TARNISHED WITH THE SAME ISSUES AS BEFELL BORG (ALSO FROM MALTA1) Barroso is equally tarnished. The 200 MEPs that have had their positions compromised are likewise tarnished. The Tobacco Directive must be sent through before the EU MEP Elections and the 200 MEPS that were laborious;y targeted with the sweetners and kick backs must be removed from the voting rolls. Now with the EU Elections up the time is here to have a serious rethink. The administration needs reducing by at least a third. The double location must be reduced to one and Strasborg is logical. The feeding frenzy of costs being made to staff for educatioal extras must be removed (it is €1000 Millionafter all) and the amaxing expenditure expenses of the MEPs including the Nigel Farge must be reduced. He as the epitome of nonsense signs in and then never attends meetings. What a farce? And there are others. Making €1 Million in expenses must be erased. Then there is the is the use fot the EU Funds. The CAP must go. The support to Oil and Gas must go, The support to big businesses given by grants and cheap loans (RWE EDF ALCOA BP Ford Dong-Energy etc etc etc) who do not and never did need these must go. and there are more. The production of ridiculous Directives must also be curtailed. The EU is there to help FLEDGLING INDUSTRIES and from what is stated elsewhere START-UPs and SMEs that have had such a hard time getting their proposals off the ground – not Mega Companies. I could trim the EU Legislative System by at least 40% and reduce the EU Budget by at least 30% at a stroke and no one would care. Well in many citizens mind, EU means EC and failed EP not representing citizens correctly. Europe is a great idea. People of Europe know that. if not there would be much more Brexit,Grexit,Portexit and others. it’s not happening because i think citizens know the benefit from organizing the European space in such manner that we can all benefit from it. but that is the theory. the practice has you show, demonstrate that citizens need to voice their concerns (first they need to be informed about all this,) for now these stories stay and born in brussels and don’t travel the the space of information to reach citizens in manner that they can do informed choices. that EU is distant, huge, corrupt and impossible to understand for the majority of people. even treaties, legislation, everything is done in such way that complexify and bureaucratize everything to the point that humans can no longer understand and grasp it. the problem is you can change something like this without a complete and drastic redesign of the whole structure. Lobby and such have far more much power then any group of citizens united to bring their voice up. one just need to see the attention and investment put into ECI to see the direction EU is taking. that direction need to change? Associations, ngo’s, militants are so far away from the EU circus that there is a barrier to bring citizen voices up to the front line. old technics like demonstrations, and even direct action, are mostly “done in the wind” for nothing while continuing to be portrayed by the Media has democratic ways to voice concerns. the real Technique to voice concern in the EU is to pour hundreds of millions of EUro to actually push corrupt MEP’s to modify and even apply lobbyist modifications into laws. and this is what’s happening since too long now. one just need to see votewatch.eu and lobbyplague website to understand what corporation push what kind of text to witch MEP’s and how does that land into an actual law. I would agree to cut EU administration drastically if the plan is to let nation states more sovereignty about the decision that will directly engage their own citizens, but it’s not the case. we are deprived of the tools to actually do something locally, nationally. By applying those magical recipe, EU is again taking out of national states their natural sovereignty to actually change something and move out. so what do we do ? cutting and imposing cuts in a gigantic machine that is becoming so big and difficult to perceive for lambda people will be difficult, mostly because the current political groups driving the EU are totally disconnected from ANY national base, they live in the Brussels Bubble, some kind of eco-political-social bubble that does not represent in any way, citizens across europe. that is of course, just my opinion. the simple fact is that politicians make a fortune out of the corru[tion ridden democratically deficient eussr that is why they do not dare to ask their own citizens for their backing on any of the edicts coming from the eussr, there is no way on earth that the UK government could have got the constituiton renamed the lisbon treaty through if they had done what they promised and held a referendum. That is why countries don’t leave their politicians are keeping them there. Seems like another huge waste of money, something synonimous with the whole rotten corruption ridden democratically deficient eussr. Barroso is certainly the face of the eussr a failed sleazy politician only interested in grabbing power and making money for himself. You suggest that the Green Primary (that will determine the two leading candidates for the Greens in the upcoming EP campaign) simply confuses the overall picture. I think it is exactly the other way around, so let me grab this opportunity to clear up a few misunderstandings around this initiative. Firstly, the Greens want to give a real voice to EU citizens and demonstrate that they can have a direct impact on EU-decision making. No European party has ever opened up the process for choosing its leading candidates in such a participatory and transparent way. No European party has used debates, online hangouts and events across Europe to mobilise voters. With our common campaign we will contribute transforming and renewing European democracy and create a European event – an idea Mr. Barroso is so rightly keen on. The Green Primary will result in the election of the two leading candidates. If the opportunity should arise we would be prepared to nominate one of them to be the Commission President. Our primary is nevertheless a rare opportunity for voters to choose the faces and hearts of our common campaign – a chance we give everyone in the EU above the age of 16 who shares our values. Having two leading candidates actually gives people more choice, and is fair at the same time. It encourages gender balance which is an important Green value and long standing practice, and leads to a more balanced representation of Europe’s citizens. Dear Ms Cremers please keep your Political leanings out of the discussion this is not a place to lobby for votes. In any event the green party policies only lead to more financial pressure on the citizens of the previously free nations been destroyed by the eussr. Mr Barrosso is an unelected failed politician given a nice job by a bunch of foreigners who don’t have my nations best interests at heart, under his jackboot we have all suffered far more than we should have due to dumb edicts from the wholly unelected commission which he presides over. The only choice to be given to the real people, i.e. not the political class is which failure do you want to make a mess next. I suggest that your insane idea of giving children the vote is that they are more maleable and amenable to your insane and unproven theories. Dear Last reporters:the Green Party has often set the scene for other Parties to copy, so we should not name call any organisation that proposes opening up the electoral process. Why not have the electorate of a Party decide whom it is that they want as a Leader. Most Political Parties vying for Election across the EU seem to have some sort of selection process even though for the most they are elected by Patricians! Unfortunately the issues that are often promoted by the Green Parties (in their collective sense) invariably as time moves forward become main-line or main-stream political issues. This is the same here in Malta as it is in the FRG or the UK and Canada. …..self-propogating mythological ideas about themselves. This is contrary to reason for these Organisations are supposed to Serve the General Public and enhance their Betterment,,,essentially they should be serving for the Common Good of Society. They do not always do that. Cutting down the Civil Service in all Countries and in the EC is a real necessity…it costs us over 30% of the total Budget….and even then the rest is often administered badly. What we need is some plain talking about the EU and the EC about what all these costings and how these are spent. There also needs to be a change in policy about expenditure and performance issues. Instead of always giving out to Countries Grants for various “allegedly important” infrastructure needs these ought to be turned in to Loans and made repayable at specified times so that the extent of the loan is limited to 15 years. This would then avoid the farce that happened in places like Ireland where Grats were given for the many water and waste-water treatment projects to which was conveniently added VAT and the EU paid for them only to realise afterwards that there was no VAT applicable. It would also stop the immoral stupidity of small countries being enticed by the Super-Economic Giants of Asia for Bail-out monies to be accepted for the Electricity Generation Companies (as Portugal and it now seems Malta) for a “so-called” minority share-holding of around 20% to find out that in a ew years that this really meant 40% (by which time the issue was too late to rectify)and then to hear that because these same organisations wish to bring their Wind Turbine and Photo-Voltaic manufacturing systems with them (as part of the deal) so as to install them within the country, that by manufacturing them in the country they become European Union manufacturers working from a European Union Manufacturing base (using only labour from their own countries0 that they can under-cut the other manufacturers in the EU and so avoid the call – recently explained and discussed within these areas – that this is unfair trading practices, and thus writing out the European Union Manufacturers in the process. How fair is this? David Muscat are you objecting to my complaint of lobbying for a specific party on this site by a senior member of that party, or that I disagree with that persons policies.? The lobbying worries me…nut then it is obvious that Mr Barroso also lobbies. The Political leanings follow on from the former..